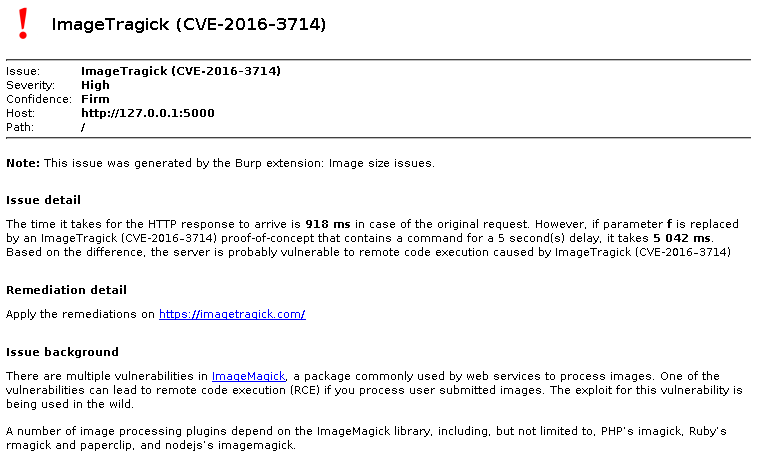 After ImageTragick (CVE-2016–3714) was published, we immediately started thinking about detecting it with Burp, which we usually use for web application testing. Although collaborator would be a perfect fit, as image processing can happen out-of-band, there’s no official way to tap into that functionality from an extension. The next best thing is timing, where we try to detect remote code execution by injecting the sleep command which delays execution for a specified amount of seconds. By measuring the time it takes to serve a response without and the with the injected content, the difference tells us whether the code actually got executed by the server. We used rce1.jpg from the ImageTragick PoC collection and modified it to fit our needs. By calling System.nanoTime() before and after the requests and subtracting the values, the time it took for the server to respond could be measured precisely. A couple of months ago we had the opportunity to take a closer look at a FireEye AX 5400 malware analysis appliance. The systems of FireEye are famous for catching targeted attacks that tend to evade traditional security systems, so we were really excited to find out more about the capabilities of this system. However we couldn’t resist taking a look at the management interfaces of the system; these turned out to be at least as exciting as our initial area of interest. The FireEye AX 5400 provides management interfaces over HTTPS and SSH. After login, the SSH interface provides a special restricted command shell (similar to the consoles of ordinary network equipment) that allows administrators to configure the device but prevents them interacting with the underlying operating system. Aside from the special shell the service was just an ordinary SSH server that allowed limited use of SCP. The SCP process could only read and write the home directories and couldn’t create directories. If the user initiated an SSH connection to a remote system, the $HOME/.ssh directory was created to store the known_hosts file. After this one could upload an SSH public key to log into the system without password, but the default shell of the account was set to the original configuration shell with limited functionality. Proxy Command - Specifies the command to use to connect to the server. Having successfully demonstrating the issue, we contacted the vendor who responded instantly, acknowledged the vulnerability and notified us on the status of the fix regularly. The official fix was released on 8th July 2014 for FEOS versions older than 7.1.0. The exploitability of the issue was limited, since attackers would have to authenticate themselves on an administrative interface that should be only exposed to dedicated network segments. Still, this vulnerability gave us a unique insight to the inner workings of the product that inspired us to continue the research of the platform. In this post I would like to share some experiences of a web application hacking project. After I got access to the admin section of the web application I realized that there is a file upload function available for administrators. The application properly denied uploading dynamic scripts (eg. : .php) and it was not possible to bypass this defense. However, the upload function supported compressed file upload and provided automatic decompression also but unfortunately the upload directory did not allow to run PHP files. One could easily assume that this setup protects from OS-level command execution via malicious file uploads but unfortunately this is not true. Since ZIP archive format supports hierarchical compression and we can also reference higher level directories we can escape from the safe upload directory by abusing the decompression feature of the target application.